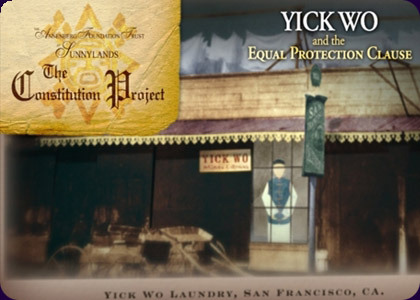 In 1880, the city of San Francisco passed a health and safety ordinance—all laundries in wooden buildings had to get the approval of the Board of Supervisors in order to obtain a license. The law, on its face, didn't single out the Chinese. But when it was applied, every Chinese laundry owner in the city was denied a permit. Every white-owned laundry was granted a permit. Yick Wo refused to shut down his business and was arrested. He fought his case from behind bars. He took it all the way to the Supreme Court. The Supreme Court determined that the ordinance was unconstitutional under the 14th Amendment's "equal protection" clause because of the unequal application of the law. It was the very first Supreme Court case to use this standard and it did so almost eighty years before the Court's landmark rulings striking down Jim Crow statutes enacted in the segregationist south. Yick Wo was not an American citizen—because by law he wasn't allowed to be. Yet the Court ruled that his rights were still protected by the 14th Amendment because it says that no state shall "deny to any person within its jurisdiction the equal protection of the laws." It does not limit that protection only to citizens. Robe Imbriano has produced for everyone from Peter Jennings to Bill Moyers, from Ted Koppel to Oprah Winfrey, winning numerous awards along the way. In over a decade at ABC News, he was part of the production teams that first brought to air series' such as "PrimeTime Live," "Day One," and "World News Now," as well as special events such as "The Century." In 1999, he founded Crystal Stair Productions, Inc., his own production company dedicated to bringing traditionally marginalized stories to a national audience. For the last six years he has led a team that has produced eleven films about the Constitution, reaching tens of thousands of schools across the country.